According to data compiled by Lori Lewis and Officially Chadd on Visual Capitalist, a single internet minute holds 1 million Facebook logins, 4.5 million videos watched on YouTube, 1.4 million swipes on Tinder (right or left, we can’t say for sure), and a total of 41.6 million messages sent on WhatsApp and Facebook Messenger. 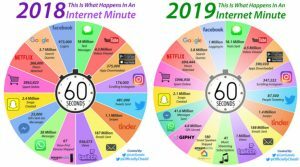 That same internet minute also contains 3.8 million Google queries, 357,222 scrolls on Instagram, and almost a million dollars spent online. *This piece was originally published by Statista. You can read the full version here.